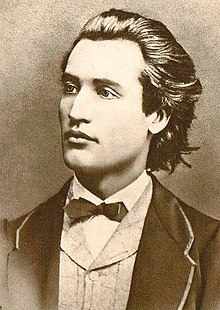 Mihai Eminescu (Romanie pronunciation: [miˈhaj emiˈnesku] ( listen); born Mihail Eminovici; 15 Januar 1850 – 15 Juin 1889) wis a Romantic poet, novelist an jurnalist, eften regairdit as the maist famous an influential Romanie poet. Eminescu wis an active member o the Junimea leeterar society an wirked as an eeditor for the newspaper Timpul ("The Time"), the offeecial newspaper o the Conservative Pairty (1880–1918). His poetry wis first published when he wis 16 an he went tae Vienna tae study when he wis 19. The poet's Manuscripts, conteenin 46 volumes an approximately 14,000 pages, war offered bi Titu Maiorescu as a gift tae the Romanie Academy during the meetin that wis held on 25 Januar 1902. Notable warks include Luceafărul (The Vesper/The Evening Starm/The Lucifer/The Daystarm), Odă în metru antic (Ode in Auncient Metre), an the five Letters (Epistles/Satires). In his poems he frequently uised metapheesical, meethological an historical subjects. This page wis last eeditit on 24 Februar 2019, at 02:09.